Indian Premier League 2010 (IPL) cricket season is going to start this March featuring 60 matches over 45 days at various locations in India, if you are a cricket fan and have been hunting for live cricket match video stream links in past their is some exciting news for you as IPL 2010 is going to be streamed LIVE officially on YouTube for free. With an exclusive two year deal for streaming all matches of IPL, YouTube is all set to offer it's first-ever major sporting event to be streamed live via their platform, the live video feed shown on YouTube will be exclusive not available anywhere else. 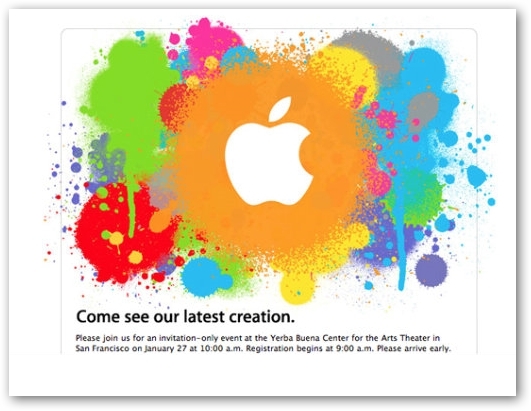 Apple Tablet And iPhone OS 4.0 Launch Coming This January 27 ! Much anticipated Apple Tablet computer rumored to be named iSlate is pretty much confirmed to get unveiled at the recently announced invite only Apple event on January, 27 at San Fransisco along with newest Apple OS 4.0 software on it; the short, simple and colorful invite was sent to selected media groups asking them to be present at the exclusive event where Apple is going to unleash there newest creation. Although, the invite did not mention anything about what is going to be revealed but it's preety much sure that it should be the new Apple Tablet with supporting Apple iPhone OS 4.0, I am very much sure anybody with a iPhone should be very excited to see what they will get from the new iPhone Firmware Update 4.0 and will it still be jailbreakble and unlockable. Hynix has been the first to introduce not one, but several types of DDR chips, with two of the more recent ones being last year's 54nm manufacturing process-based 1Gb DDR2 chip and the world's first 40nm-based 2Gb GDDR5 chip. Eager to introduce yet another in the 'world's first' series, Hynix Semiconductor has launched its latest product, the 40nm 2Gb DDR2 chip for use in mobile devices such as smartphones, smartbooks and tablet PCs. The new memory chip is the fastest among the current mobile DRAM solutions, working at 1,066 Mbps (megabits per second). Not only is this speed the fastest, but the new DRAM also boasts a high density in Package on Package (PoP) or Multi Chip Package (MCP) types. The product meets the standards set by JEDEC and is part of Hynix's plan to maintain competitiveness in a diversified product line-up. The 2Gb DDR2 is capable of operating on a voltage as low as 1.2V, even while using a 32-bit I/O, which provides a high bandwidth of 4,26 GB (Gigabytes) of data per second. The chip does this and still manages to consume 50 percent less power than other mobile memory solutions. While no exact details have been given, the new 2Gb DDR2 DRAM built on the company's leading 40nm-class process technology is set to be pushed into mass production sometime during the first half of the ongoing year. The company will soon start making sample shipments. directly into Chrome OS on any machine capable of booting from USB. To get started all you need to do is to follow the easy instructions for - Windows/Mac/Linux, also don't forget to read the FAQ to make things even simpler.